Arsene Wenger says Mesut Ozil's negative comments about Arsenal's season were "not welcome". The Gunners boss will speak with the Germany midfielder about his suggestion in midweek that Arsenal had "mucked up" their Premier League title challenge. "I agree the statement is not welcome," said Wenger. "No matter if it just one chance in 100, we have to believe." Three wins in 10 Premier League games have left Arsenal 11 points behind leaders Leicester with a game in hand. Arsenal are at home to Watford on Saturday in a repeat of last month's FA Cup quarter-final, which the Hornets won. 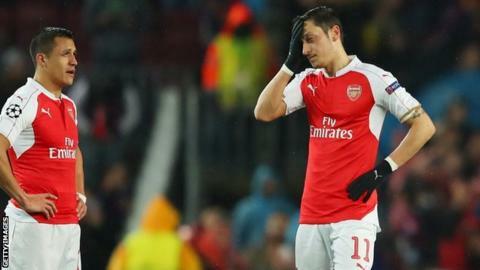 Asked whether he would discuss the quotes with Ozil, Wenger said: "We will talk about that of course. "The worst thing in life is to have wrong beliefs. You have to make sure you give absolutely your best, and at the end accept if somebody is better than you."